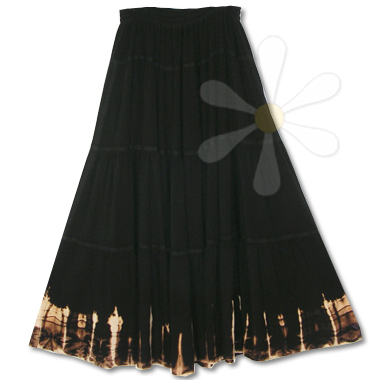 TIRAZ-SPECIAL SKIRT... IN STOCK NOW! This soft-as-a-kitten skirt is the most delicious susti (susdi) cotton/rayon -- the' cashmere of cottons'... and here, expert dyers dip the hem to remove color, a traditional African craft that's centuries old. The effect is earthy and wild, and authentically tribal. It's crafted by the same family that originated this yummy blend in the ancient city of Fez... and has just the right touch of magic! The TIRAZ is a tiered gypsy skirt, but it's anything but common! See details and measurements for this style on the main TIRAZ page. Treat yourself to something especially wild and fun... express your inner goddess every day!